July 1 - Saint Junipero Serra, Priest - USA Optional Memorial - My Catholic Life! The United States of America’s impressive Capitol building, in Washington D.C., includes the equally majestic, semicircular, Statuary Hall. Each of the fifty states is allowed to choose two citizens of historic importance to represent the state in the Hall. Statues of one nun and four Catholic priests, two of them saints, grace Statuary Hall, including today’s saint. Junipero Serra was the founder of California. He was the pathbreaking, indestructible, priest who trekked California’s mountains, valleys, deserts, and shores to establish nine of its eventual twenty-one missions. He founded Monterey and San Francisco with a High Mass, Marian procession, and canon shot from the galleons offshore. He established San Diego after a daring desert adventure. California’s mix of rugged cattle ranching, luxurious orchards and vineyards, distinctive Mission architecture, and blending of Mexican and Native American heritage, is the legacy of Fr. Serra and his Franciscan confreres. The Franciscan city names tell the story: San Francisco, Ventura (Saint Bonaventure), San Luis Obispo, Santa Clara, Our Lady of the Angels (Los Angeles) and on and on…. Fr. Junipero Serra was baptized as Michael Joseph on Mallorca, an island off the coast of Spain, in the Mediterranean Sea. He grew up in a dirt poor and devoutly Catholic family. After joining the Franciscans and moving to the large city of Palma de Mallorca, he took the religious name of Junipero after one of Saint Francis of Assisi’s first followers. After priestly ordination, Fr. Junipero obtained a doctorate in philosophy and taught that subject to Franciscan seminarians. He was destined to lead a successful life as an intelligent, holy, and pious intellectual. But in the Spring of 1749, he felt the Lord calling him to become a missionary to New Spain (Mexico). On the fateful day of departure, he kissed the feet of all his brother Franciscans in the monastery, from the oldest to the youngest, boarded a ship, and sailed away from his native island for the very first time. Our saint’s life began in earnest in his middle age. His long years of intellectual, spiritual, and ascetic preparation steeled his body, mind, and will for the rigors to come. Arriving in the port of Veracruz, Fr. Serra and one other Franciscan, among the larger group from Spain that he traveled with, decided to walk to Mexico City rather than go on horseback. Along this first of many treks, he was bitten by either a snake or a spider and developed an open wound that never healed for the rest of his life. It caused him constant pain. Fr. 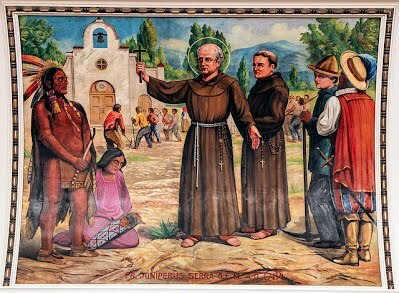 Serra spent the first several years of his missionary life in a mountainous region of central Mexico, among an indigenous population that had encountered Spaniards, and the Catholic religion, two centuries before. Fr. Serra wanted a rawer experience. He wanted to meet and convert pagans who had never had contact with Christianity or anyone outside their tribe. After years of faithful service as a missionary, church builder, preacher, and teacher in central Mexico, he finally had his chance. The Franciscans were tasked with leading the religious element of the great, and first, Spanish expedition into Alta California, the present day American state. If Fr. Serra had never gone to California, he may still have been a saint, but one known to God alone. It was the challenge of California that made Fr. Junipero into Saint Junipero. In his mid-fifties, Fr. Serra was the head priest of a large migration of men, women, soldiers, cattle, and provisions whose goal was to settle California for various reasons of church, state, and commerce. This is when the California missions were founded, the vast farms and cattle ranching enterprises that doubled as lay monasteries, churches, and houses of formation that have left such an enduring mark on California. For the last fifteen years of his life, Saint Junipero is seemingly everywhere. Walking, confirming, working, preaching, fasting, planning, sailing, writing, arguing, founding, praying. He exhausts his poor, emaciated, body. Near the end, he is recognized by all as the indispensable man. And he dies just as the United States is becoming a country on the other side of the continent. He is a priest founder, but not of a religious order. He founds a society, in all of its complexity. His accomplishment will only be appreciated decades later, when Americans come to far off California looking for gold, and are surprised to discover a vast, developed culture far more complex than their own. Saint Junipero Serra, inspire us to follow your example of physical perseverance, doctrinal commitment, and spiritual discipline for the good of the Church. You were a model priest and missionary. You were an exemplary Franciscan. May we too be great in all that we do.